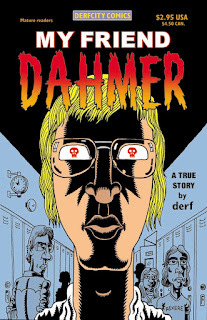 MY FRIEND DAHMER BLOG: Ebay riches for My Friend Dahmer fans! Ebay riches for My Friend Dahmer fans! 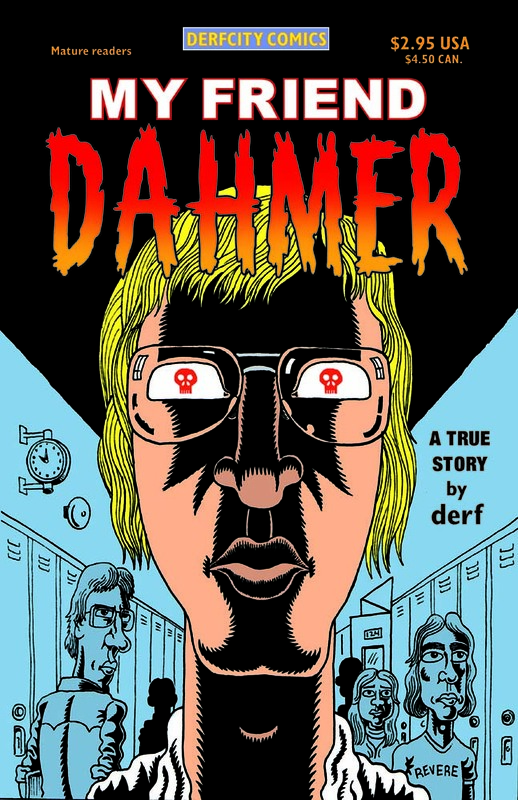 Don't usually re-post items from the Derfcity blog, but this one is of special interest to My Friend Dahmer fans. The original, out-of-print, self-published My Friend Dahmer comic book (above) that I put out in 2002 is now selling for $80 on ebay! If you have a copy, my advice is SELL NOW! Here's the story behind this book. I started work on the Dahmer story in early 1995, a few months after his death in prison. Before that, from 1991 when he was arrested and his grisly crimes revealed to the world, it had existed only as sketchbook notes and drawings. But after he was killed, I finally decided to see what I could do with this project. Over the next two years I drew six short stories. The few people I showed these two urged me to finish them and get them in print. So I sent the best of the stories to Fantagraphics' Zero Zero, a popular anthology title of the Nineties. They snapped it up right away and made it the lead story in the next issue. This received a nice buzz in the comics press and some good reader reaction, so in 1998, I sat down and wrote and penciled a 100-page graphic novel. This bears little resemblance to the graphic novel I eventually produced. It was really just a loose collection of Dahmer short stories. There was no overall story arch, and it wasn't researched at all, it was purely straight memoir. The artwork was a lot rougher, since I was still firmly entrenched in my comic strip style. Above: devoted fangirl reads the original MFD on Youtube. It was still pretty good, I thought. But I sure as hell couldn't convince anyone else of that! I spent the next four years trying to sell this book to a publisher, in vain. Every company in the biz turned me down! So in 2002, frustrated and stonewalled, I self-published this 24-page floppy. The hope was it would generate some interest in the larger work I envisioned. That, in fact, didn't happen, but much to my shock this little comic became an instant cult classic! When the buzz died down, these stories were now seven years old. In the interim, I had produced Trashed, a more polished effort. At that point, I decided to chuck everything I'd done, broaden the scope of the project and start over. The result is the best-selling, critically acclaimed book that came out this year. BUT... as a reward, just for you Derfcity readers, and the point of this post, my pals at SLG Publishing, the folks who put out Trashed, The City: Collected and Punk Rock & Trailer Parks, have a limited stock of this out-of-print comic. And they're selling it at the $2.95 cover price! Don't hesitate if you want a copy. Looks like it's fetching around $200 now. Not sure I want to part with mine, though. It's one of my favorites. Very happy about the film. Congrats!